It's time! Winter has finally set in, and, as I am typing this, it's raining. This rain will drop the temperature further, bringing in more cold and fog. Just today, I managed to get in a couple of plants to celebrate the winter season better. 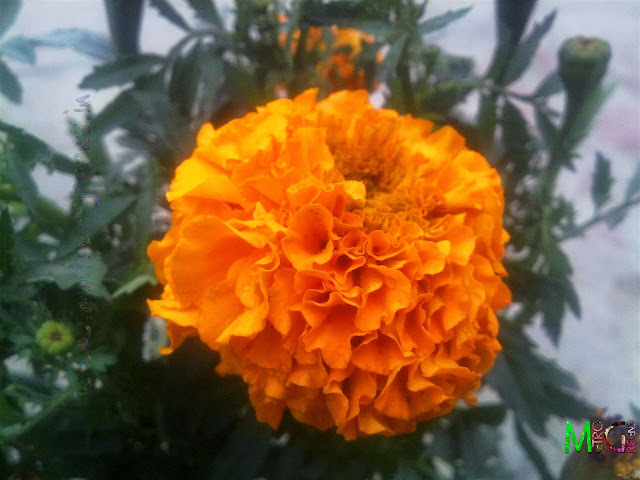 The chrysanthemums, I shared in the last post, are profusely blooming these days, giving a delightful view of the blooms, white and orange chrysanthemums blooming in a few of my pots, and believe me, when I say, it's breathtaking. I can only imagine seeing these beautiful plants blooming on a piece of land. 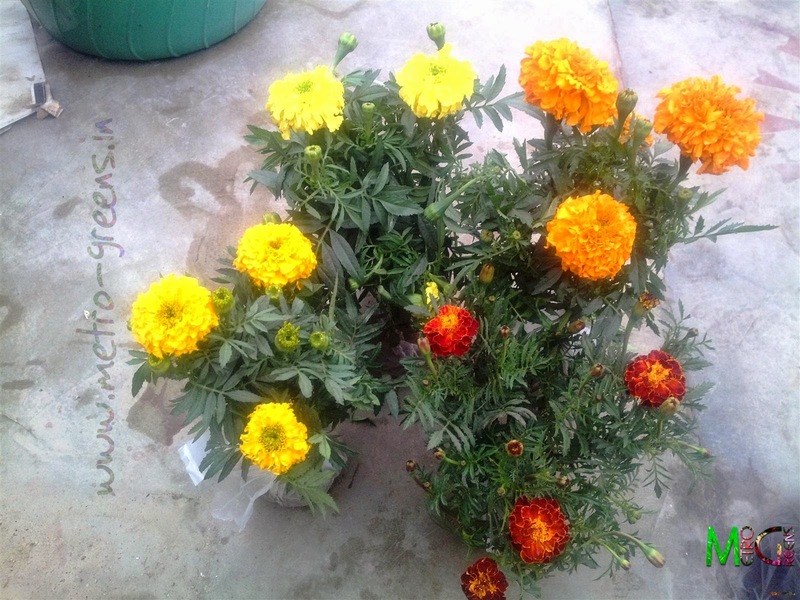 Anyways, back to my newest plants, this time around, I decided to lay my hands on a few marigolds - hybrid ones, the ones, which bear huge blooms, with the plant height remaining under a feet. The regular ones, which, I've seen reaching more than 6 feet (remember, I did a post on one of my biggest marigold plants, one that reached 82 inches in height.) In case you'd like to revisit it again, here it is. This is the first time, I've bought marigold plants. Otherwise, I've been growing marigold plants from seeds that I get from dried flowers in garlands we get. And believe me, it's pretty easy growing marigolds from these seeds. As I visited the plant seller, I was mesmerized by the vivid colours of the marigold blooms, I saw. I bought the plants, four of them, in different shades of yellow to orange and a dark red one as well. 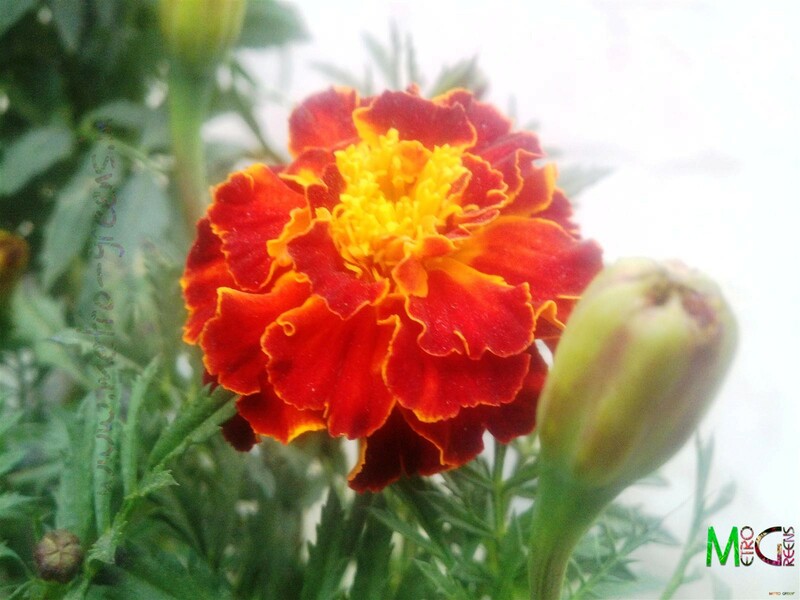 The maroon marigold bloom. Looks pretty nice, right? One of the shades of the yellow marigold. 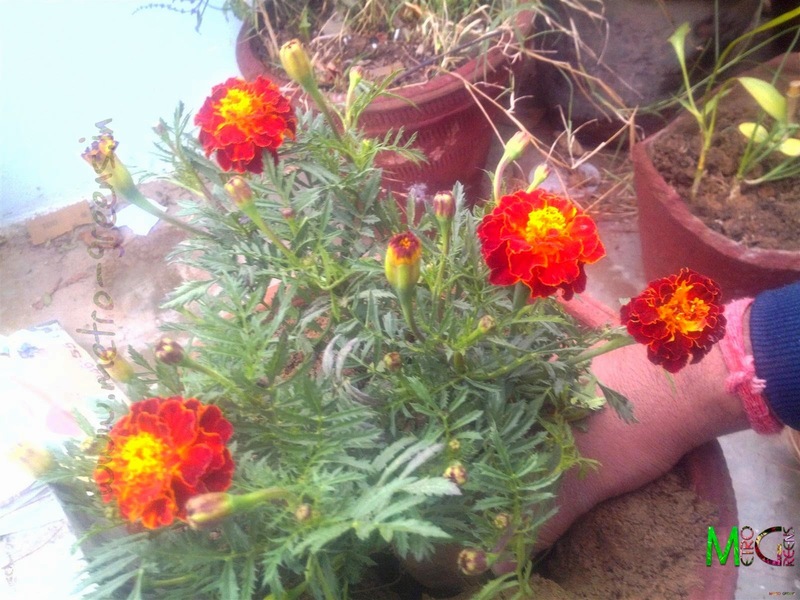 The maroon marigold plant, shot while I was planting it in the pot. Let's take a look at the plants. I've transferred these to pots, and I hope the rain will help the plants grow and stabilize pretty well with the new conditions, and I hope, the plants will add colours to my garden, which, already is a quite colourful with the chrysanthemums blooming completely. 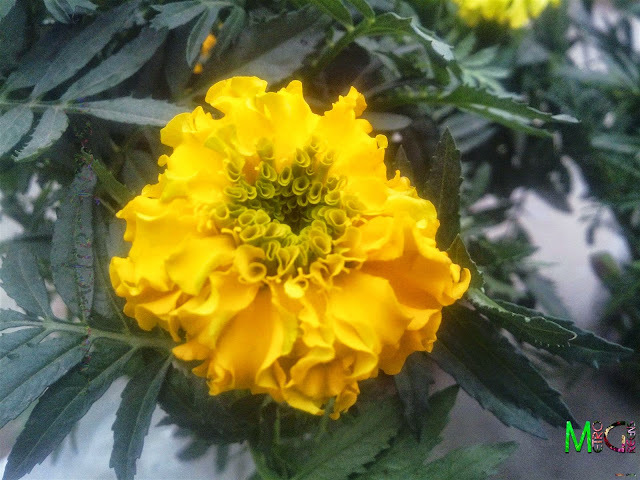 But, these plants, will take some time growing and stabilizing in the new conditions, and while the mums will put an end to their yearly show in a couple of weeks, the marigolds will continue blooming, playing partners to dahlias and calendulas, which I'll be getting in the coming weeks. Apart from the marigolds, I have got a couple of hybrid miniature roses, that too, for the first time. We'll talk about them in the next post, in the coming week. Till then keep trying and HAPPY GARDENING! Good to see four different shades of the same flower. I had recently bought myself a rectangular pot, filled it up with mud and planted a few seeds of dhania. I got 3 inch tall coriander now. The only problem,i hate to cut it to even use. That's the toughest work mom ever gave me! You're right, Manogna, it pinches when you plant something, nourish it and then you're supposed to kill it. But then, that's the way of life. Something goes off, new things come in. Keep up the good work.